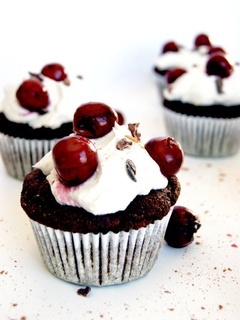 Grain and dairy free black forest cupcakes from Alexandra at [Occasionally Eggs](http://www.occasionallyeggs.com/2015/02/black-forest-cupcakes-grain-free-dairy.html). Hazelnut Praline Ganache Cupcakes from Connie at [Chocolate + Connie](http://www.chocolateandconnie.com/hazelnut-praline-ganache-cupcakes/). Chocolate Surprise Cupcakes from Maria at [She Loves Biscotti](http://www.shelovesbiscotti.com/chocolate-surprise-cupcakes/). Vegan Chocolate Cupcakes from [Mr. Moo's Adventures](http://www.marlowmoo.com/2012/09/delightful-vegan-chocolate-cupcakes.html). Chocolate Whiskey Cupcakes with Vanilla Icing and Caramel Drizzle from Sarah at [My Nana's Kitchen](http://mynanaskitchen.ca/2013/11/07/the-750-decadence-dor-cupcake/). Chocolate Oatmeal Cupcakes from Regina at [Leelalicious](http://leelalicious.com/chocolate-oatmeal-cupcakes/). Chocolate Cupcakes with Boiled Frosting from Beth at [bethdunham.ca](http://bethdunham.ca/updatesnews/2015/6/11/chocolate-cupckes-with-boiled-frosting). Queen of Hearts Cupcakes from Alicia at [Bakeaholic](http://www.bakeaholic.ca/cupcakes/queen-of-hearts-valentines-cupcakes/). Chocolate Peanut Butter Cupcakes (stuffed and frosted!) from Randa at [The Bewitching Kitchen](http://www.thebewitchinkitchen.com/chocolate-peanut-butter-cupcakes/). Death By Chocolate Cupcakes from Stacie at [Simply Stacie](http://www.simplystacie.net/2015/10/death-by-chocolate-cupcakes/). So excited to see our post here – thanks!! Also, can’t wait to try the others! Soo decadent!! Love the new look of roundups too! Thanks Regina! We’re experimenting with them. Hope this version encourages lots of clicks! Thanks for taking part Alicia!